Birds have an impressive ability to navigate. They can fly long distances, to places that they may never have visited before, sometimes returning home after months away. Though there has been a lot of research in this area, scientists are still trying to understand exactly how they manage to find their intended destinations. Researchers track migrations of individual birds around the globe using satellite and GPS technology. This video, along with the video "Bird migrations in Movebank: Americas" shows the recorded movements of 1,654 individual birds that were tracked between 1992 and 2012. Much of the research has focused on homing pigeons, which are famous for their ability to return to their lofts after long distance displacements. Evidence suggests that pigeons use a combination of olfactory cues to locate their position, and then the sun as a compass to head in the right direction. We call this “map and compass navigation”, as it mirrors human orienteering strategies: we locate our position on a map, then use a compass to head in the right direction. But pigeons navigate over relatively short distances, in the region of tens to hundreds of kilometres. 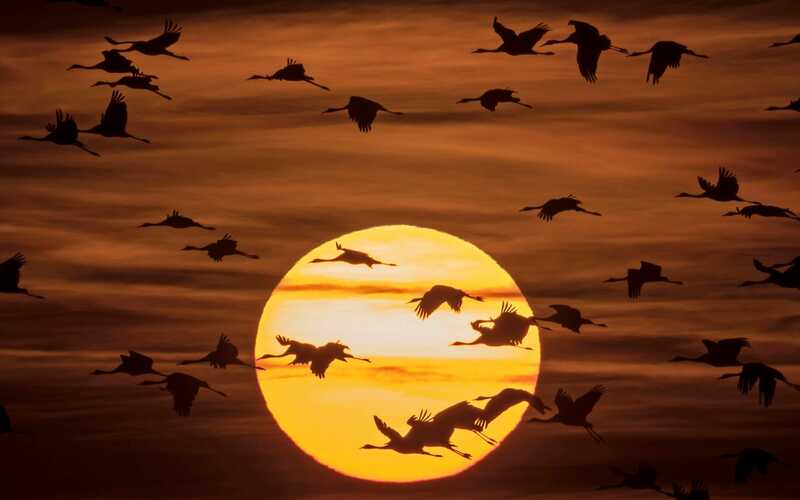 Migratory birds, on the other hand, face a much bigger challenge. Every year, billions of small songbirds travel thousands of kilometres between their breeding areas in Europe and winter refuges in Africa. This journey is one of the most dangerous things the birds will do, and if they cannot pinpoint the right habitat, they will not survive. We know from displacement experiments that these birds can also correct their path from places they have never been to, sometimes from across continents, such as in a study on white crowned sparrows in the US. Over these vast distances, the cues that pigeons use may not work for migrating birds, and so scientists think they may require a more global mapping mechanism. To locate our position, we humans calculate latitude and longitude, that is our position on the north-south and east-west axes of the earth. Human navigators have been able to calculate latitude from the height of the sun at midday for millennia, but it took us much longer to work out how to calculate longitude. Eventually it was solved by having a highly accurate clock that could be used to tell the difference between local sunrise time and Greenwich meantime. Initially, scientists thought birds might use a similar mechanism, but so far no evidence suggests that shifting a migratory bird’s body clock effects its navigation ability. There is another possibility, however, which has been proposed for some time, but never tested – until now. The earth’s magnetic pole and the geographical north pole (true north) are not in the same place. This means that when using a magnetic compass, there is some angular difference between magnetic and true north, which varies depending on where you are on the earth. In Europe, this difference, known as declination, is consistent on an east west axis, and so can possibly be a clue to longitude. This episode explores animals' ability to perceive magnetism or “magnetoreception." We know from behavioral evidence that many organisms, from bacteria, to lobsters, to pigeons sense and respond to magnetic fields but we are just starting to learn how this works. To find out whether declination is used by migrating birds, we tested the orientation of migratory reed warblers. Migrating birds that are kept in a cage will show increased activity, and they tend to hop in the direction they migrate. We used this technique to measure their orientation after we had changed the declination of the magnetic field by eight degrees. First, the birds were tested at the Courish spit in Russia, but the changed declination – in combination with unchanged magnetic intensity – indicated a location near Aberdeen in Scotland. All other cues were available and still told them they were in Russia. If the birds were simply responding to the change in declination – like a magnetic compass would – they would have only shifted eight degrees. But we saw a dramatic reorientation: instead of facing their normal south-west, they turned to face south-east. This was not consistent with a magnetic compass response, but was consistent with the birds thinking they had been displaced to Scotland, and correcting to return to their normal path. That is to say they were hopping towards the start of their migratory path as if they were near Aberdeen, not in Russia. This means that it seems that declination is a cue to longitudinal position in these birds. There are still some questions that need answering, however. We still don’t know for certain how birds detect the magnetic field, for example. And while declination varies consistently in Europe and the US, if you go east, it does not give such a clear picture of where the bird is, with many values potentially indicating more than one location. There is definitely still more to learn about how birds navigate, but our findings could open up a whole new world of research.